So how can technology help kids other than apps on mobile devices? Ask your child’s teacher if they send homework on mobile devices. Many schools are creating electronic files for homework assignments, as well as media files students can put on their mobile devices and take home with them. This gives you an opportunity to help kids with specific assignments on their mobile device and makes their work mobile too. There might be less lost homework when done in this format, since kids tend to keep up with their mobile devices. Multimedia projectors and PowerPoint presentations engage kids with video and audio and help organize information into specific sections for better understanding. Parents might ask teachers if they could send PowerPoint files home with kids on USB drives, so that parents could help children with the information in the presentation at home. Even smart devices such as tablets can now be used with PowerPoint. Look for educational programs for your home computer to supplement your child’s schoolwork. There are several educational programs and games online that students can use to practice important skills. Educational apps are ideal since they can access mobile devices anywhere, but many desktop applications are worthwhile as well. For kids with severe learning difficulties, look for specific programs that address these issues such as apps for children with dyslexia or sensory processing disorder. 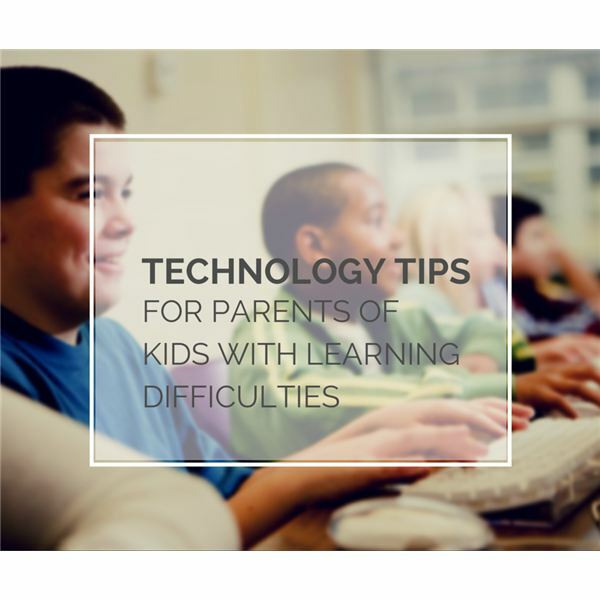 Your school’s special education coordinator or parent center may have information on helping the child with specific learning problems through technology. For students with auditory discrepancy processing problems, find programs that sound out similar sounds and help them discriminate between words and phrases. Many technological advances have been made to help students with visual impairments using technology that relies on auditory responses. Many schools now use a digital response system to answer questions in class, which appeals to shy students or students with learning difficulties who are slow to respond. It gives teachers a way to monitor the progress of these kids without drawing too much attention to their delays. Use social media to encourage shy kids to interact. This must be monitored so kids don’t fall victim to bullying or cyber attacks, but social media can be highly beneficial for kids who are struggle with taking the first step toward making new friends. Use technology to inspire creativity among struggling learners. It is a common misconception that slower learners cannot be creative. The opposite may actually be closer to the truth. While creative people often excel in a specific area, some have great difficulty in others. Einstein struggled with math the way it was taught in the public schools, but look at what he did! You can use modern technology to inspire creative thinking by asking kids to create their own games with such tools as Game Salad. Even if they don’t make a career of it, they will feel good about producing something unique that they can call their own. Have kids write a blog to increase written expression skills. Many kids with learning difficulties have trouble with expressive writing. Write a daily blog is fun and helps build skills that will improve their abilities in Language Arts over time. Blogger.com has security options so you can keep the blog private if you don’t want others to view it. Technology is changing the way teachers teach in the special education and other learning programs in public schools. Check into the technology that is being used in your child’s school and then inquire as to how you can reinforce this at home.